In the months leading up to the 2016 presidential election, liberal outcry over ethnonationalist views promoted a vision of America as a nation of immigrants. Given the pervasiveness of this rhetoric, it can be easy to overlook the fact that the immigrant rights movement began in the US relatively recently. This book tells the story of its grassroots origins, through its meteoric rise to the national stage. 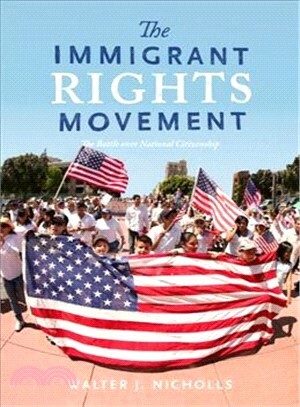 Starting in the 1990s, the immigrant rights movement slowly cohered over the demand for comprehensive federal reform of immigration policy. Activists called for a new framework of citizenship, arguing that immigrants deserved legal status based on their strong affiliation with American values. During the Obama administration, leaders were granted unprecedented political access and millions of dollars in support. The national spotlight, however, came with unforeseen pressures—growing inequalities between factions and restrictions on challenging mainstream views. Such tradeoffs eventually shattered the united front. The Immigrant Rights Movement tells the story of a vibrant movement to change the meaning of national citizenship, that ultimately became enmeshed in the system that it sought to transform. Walter J. Nicholls is Associate Professor of Urban Planning and Public Policy at the University of California, Irvine. He is the author of The DREAMers (2013) and Cities and Social Movements (2016).